Editor’s note: Patients see Dr. William Leone, head of the Leone Center for Orthopedic Care at Holy Cross Hospital in Fort Lauderdale, as someone they hope will eliminate their pain and help them get back to an active lifestyle. But they might not recognize the person he is outside the office and operating room. 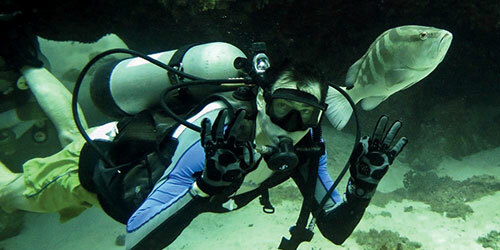 The 59-year-old orthopedic surgeon is also a diver, pilot, an inventor and a builder, as well as a husband and father. Meet him here in our ongoing series, Avocations: Life beyond work. Some physicians might buy a fancy house or fast car after finishing medical school. The first thing Dr. William Leone did was buy a plane and take lessons until he earned a commercial pilot’s rating. Dr. Leone grew up in Miami and loved being in the ocean. He earned scuba certification at the age of 13 and spent many hours hunting for lobsters in Biscayne Bay. He still loves diving. “It’s a wonderfully tranquil experience and a privilege to go into a different environment and not leave a footprint,” he says. At first, he thought he might become a hand or plastic surgeon. But he’s glad he chose orthopedics “People come to me broken, and they feel all their quality of life is gone,” he says. “Then I do something to make them better and their pain is gone. I built my practice by being the one who took cases nobody else wanted. In 2009, he decided to make changes to his practice by reducing the number of cases he takes. “I was always running faster and faster. Now I have a destination practice geared toward people with special problems, and I get a lot of patients from out of the country,” he says. The slower pace also allows him to have dinner most evenings with his wife, Dee Ann, and 18-year-old daughter, Alessandra. On Saturday mornings, they walk or run together on the beach. They also have three dogs. “All of them are rescues, and they’re part of our family,” he says.